The first mention of the existence of the municipality of Vacallo dates back to 1335. At that time the village fell under the jurisdiction of the Parish of Balerna. Vacallo then detached itself and became its own independent parish in 1573. The church of Santi Simone e Giuda Taddeo (originally dedicated to the saints Simone and Fedele) is cited in the act of separation as the only religious building at the time. Not until the 17th century was the church of Santa Croce built around an old chapel at the height of the Baroque period. Vacallo has always been an agricultural area, as indicated by the three bunches of grapes found in the coat of arms symbolising the three districts (Pizzamiglio, Roggiana and San Simone), which are separated by a white “V”, the initial of the village’s name but also thought to represent the fourth district, Vacallo Alta. The building industry was a major source of employment in Vacallo in the past, with many labourers and artisans working on a seasonal basis. Several famous artists were also born in Vacallo. These include the sculptors Pietro and Giuseppe Lironi and Pietro Bernasconi, who helped adorn the churches in the village, and the architect Giovanni Antonio Piotti (known as “il Vacallo”). Piotti was perhaps the greatest exponent of Lombard Mannerism and designed the church of Santa Croce in Riva San Vitale (1582-1591), to name just one example of his work. A more recent artist from Vacallo was the sculptor and painter Serge Brignoni (1903-2002), born in San Simone. Sitting at the foot of Monte Bisbino, Vacallo has become a much sought-after residential address in recent decades. Its population grew from 550 inhabitants in 1850 to 1,434 inhabitants in 1950. It now has some 3,000 inhabitants. 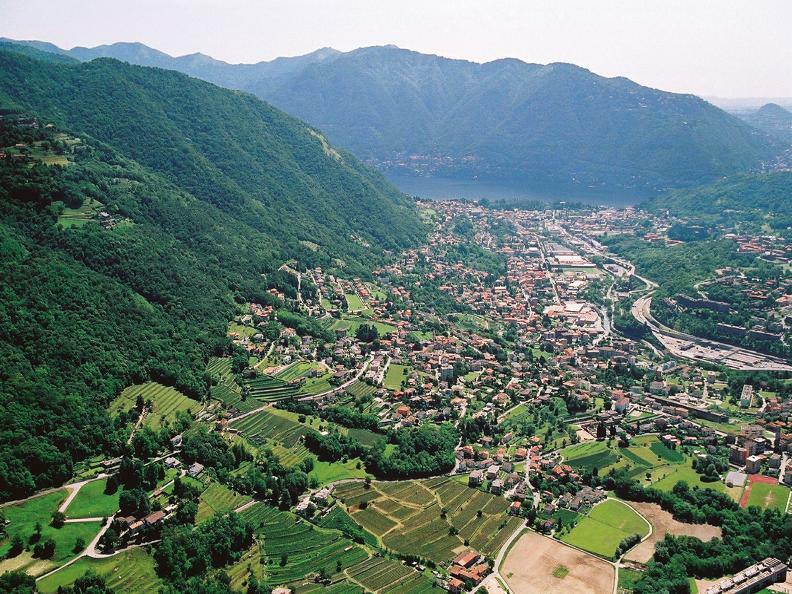 Close to the Pizzamiglio customs route, Vacallo adjoins the Italian towns of Cernobbio, Como and Maslianico. A nice tradition was initiated a few years ago between Vacallo and Maslianico, reflecting their good neighbourly relations: the mayors of the two towns hold a joint annual meeting, normally in the first half of January.